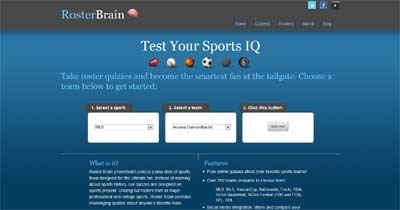 Roster Brain quizzes sports fans about the rosters of their favorite teams. With incorporated player profiles, packed with details, the site aims to simultaneously help passionate fans learn about a roster while taking the monotony out of staring at a list of players. Sports trivia as it exists elsewhere focuses almost entirely on the past. Roster Brain bucks the trend by focusing it’s quizzes entirely on present sports rosters…providing a fun learning environment for passionate fans.